"Willie Gillis: Package from Home" by Norman Rockwell. Norman Rockwell's World War II painting "Willie Gillis Food Package from Home" fetched $2.8 million from a private buyer at an auction in Chicago on Saturday, the auction house said. The winning bid for the iconic artwork was less than the up to $5 million estimated ahead of the auction, said Emily Betts Susanin, director of marketing and communications for Susanin's Auctions in Chicago. But it was "great news" nonetheless, she said, adding that no other painting had ever fetched more at a Chicago auction. Renowned American artist Rockwell did a series of Willie Gillis paintings for the cover of the Saturday Evening Post magazine, starting with the "Package from Home" on Oct. 4, 1941, and continuing through "Willie Gillis in College" on Oct. 5, 1946. "Package from Home" had been privately held in Chicago for decades. Susanin did not disclose the identity of its new owner. 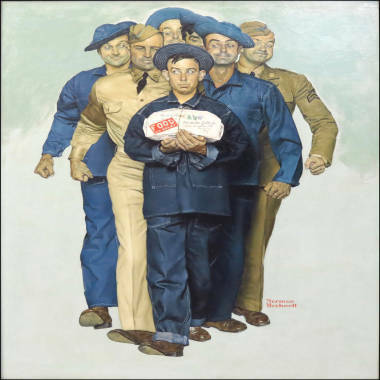 As America entered World War II, Rockwell introduced Willie Gillis, a fictional character, as an enlisted man surrounded by fellow servicemen, receiving a food package from home. Rockwell was most known for his cover illustrations of everyday life he created for the Post over 47 years. The Willie Gillis series is among Rockwell's best-known work but other famous paintings include "Rosie the Riveter," "Saying Grace" and the "Four Freedom" series. Rockwell's "Rosie the Riveter" sold at auction in 2002 for nearly $5 million. In 2006, Rockwell's "Breaking Home Ties" fetched a record $15.4 million from an anonymous buyer. The previous record high for a painting sold at a Chicago auction was set in 1991 when Vincent van Gogh's "Still Life with Flowers" brought $1.43 million.